SEATTLE—Don’t miss your last chance to experience this comprehensive and powerful exhibit of the Great War at Seattle’s Museum of History & Industry (MOHAI). Closing February 10, WW1 America tells an important story of Americans—both the legendary and the unsung—who made history in a turbulent era. Developed by the Minnesota History Center in partnership with the National Constitution Center, the National World War I Museum and Memorial, the Oakland Museum of California and the Bob Bullock Texas State History Museum, WW1 America reveals the transformational effects of the Great War on American life, including the emergence of the Puget Sound Region as a major industrial, trade, and military hub. The Great War that began in Europe in the summer of 1914 quickly drew in all parts of the world—including the United States, even though the country did not enter the war until April 1917. The World War I era—1914 to 1919—was transformational. America emerged as a confident global superpower, but the war also led to deep divisions and conflict that threatened to tear the nation apart. Generous support for WW1 America is provided by The State of Washington, The Boeing Company, Seattle Office of Arts & Culture, Mike Repass, The Simpson Family Fund, 4Culture, Bartell Drugs, BNSF Railway, and MOHAI Exhibits Fund. Media sponsors are KCTS 9, KUOW, and The Seattle Times. The promotional partner is Visit Seattle. Enjoy special screenings of the new film, Labor Wars of the Northwest covering three decades of labor strife in the Pacific Northwest at the turn of the 20th century. This one-hour documentary reveals the plight of working-class men and women who battled for better wages, reasonable hours and workplace safety. Screenings will be followed by a discussion with director and local historian David Jepsen. For six days Seattle stood still as thousands of workers walked off the job. 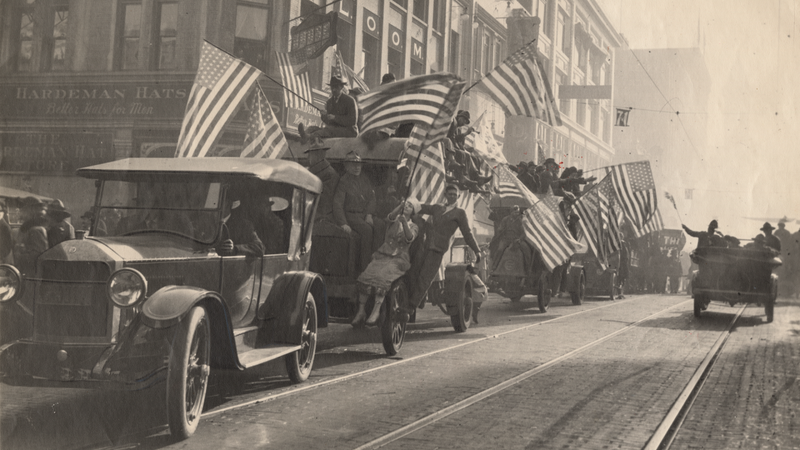 Making headlines around the world, the 1919 General Strike inspired others in the labor movement both nationally and internationally. Experience this historic moment through an immersive performance featuring the voices of workers, politicians, businessmen, and live music. The evening will include a pop-up exhibit, hands-on activities, and a post-performance Q & A.Created in collaboration with the UW Labor Archives of Washington, historian James Gregory, playwright Ed Mast, and the Seattle Labor Chorus. Follow the life of author and labor activist Anna Louise Strong in this sweeping documentary.As a reporter she covered the major political revolutions of the 20th century in Russia, Spain,and China. Her political vision took shape in the Pacific Northwest after witnessing the 1916 Everett massacre and chronicling the 1919 Seattle General Strike. Stay after the screening for a discussion with the film director Lucy Ostrander and local historian Stephanie Ogle. Image captions: Front page of November 1918 issue of The Seattle Star, announcing the end of World War I, Museum of History & Industry.